As we travel through the Middle Kingdom, its easy to forget that we travel in a country with a political system very different from our own. We are lulled into a false sense of familiarity. Colonel Sanders smiles benevolenty from KFC-logo'd storefronts. Starbucks, Dairy Queens and the inevitable Golden Arches can be found in all of the major cities we've visted thus far. Beijing has been massively built-up and modernized for the Olympics. Traffic is almost orderly, the streets are spotless. In a way, it's almost disappointing. As we go from 4-star hotel, to tour bus, to scenic tourist spot, we can marvel and wonder that we are touring in a very foreign country, but we feel like tourists, not travelers. When does the adventure begin? As we move away from the capitol, things change. Almost all the commercial trappings of the "West" disappear. A bizarre variety of Rube Goldberg-esque three-wheeled vehicles at times outnumber those with four. 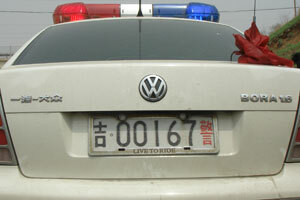 The horn replaces the turn signal as the primary means of communication on the street. 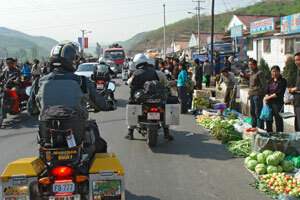 Traffic becomes congested and chaotic at first, then, even the vehicles seem to dissappear. We enter large towns with wide streets, and virtually no traffic. 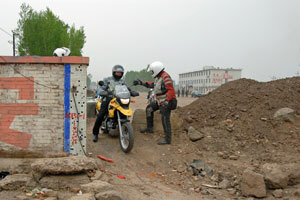 Missed turns and road construction "detours" give our riders their first taste of rural China, and their first opportunities to ride "off-pavement". The Adventure begins this week, Come Ride with Us! The Live!Journal wasn't mean to be my personal diary of this year's World Tour. Helge has been doing his part, sending me a steady stream of properly formatted digital images. These come in via email. Even if we're next door to one another at the hotel du jour, we work different schedules on our non-riding days, and there's regular email between us. However, with the exception of Jeff and Ann , and Frank, I have yet to receive anything from our other participants. It's not too hard to understand why. Given the choice of exploring a new country, or sitting in a small and muggy internet cafe or business center, which would you choose? It's OK. Distance-wise, we've only covered about 10% of the ride so far. We're just into week two. 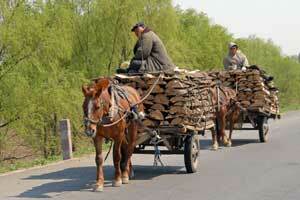 There's plenty of time ahead for email and the internet as we enter Siberia. 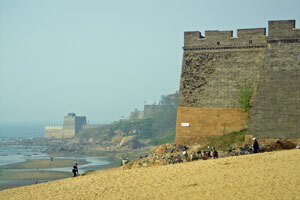 For now, here are some images of Old Dragon Head in Shanghaiguan, the eastern end of the Great Wall of China, where the Wall actually comes down to the Yellow Sea. Somewhere on the road between Shanghaiguan and Shenyang (as we, coincidentally make our closest approach to North Korea, the border about 170 kilometers away), China becomes rural, agrarian, generally slower-paced. Except for the highway buses, which begin blasting their air horns when still 1/4 kilometer away, thus establishing their intention to pass the entire convoy regardless of whether or not there is any on-coming traffic. And a convoy it is. With a guide vehicle, 18 nicely staggered bikes in formation, a sidecar at the end of the pack, and a chase vehicle, blinkers continually flashing, bringing up the rear, we stretch out for quite a ways. Wherever we stop, whether for gas, or lunch, the insatiably curious people of this fast emerging nation stop to gawk at these foreigners in their strange garb. At first, it's just the employees and attendants. Soon, vehicles passing by make a U-turn to come and look, drivers often parking their cars, tricycles, trucks and tractors in the street to step out and see what's going on. 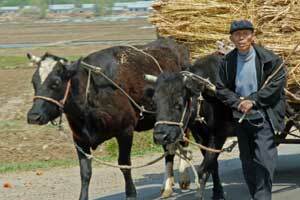 Unlike the West, in most of Asia, the whole notion of "personal space" doesn't exist. Even the simple task of walking around one's bike to open a pannier for a bottle of water or Snickers bar is a steady process of gently pushing through the crowd, nudging people out of the way. As you open the pannier, the crowd presses in even closer to see what's inside. As you look up, you'll see someone else is wearing your helmet, and your gloves are being passed around for inspection. As you make eye contact with the person currently assessing the quality and construction of your gear, you'll get a big smile and a thumbs up, the quality and materials have passed the test. Everything will eventually make it's way back, nothing has ever been taken or stolen. 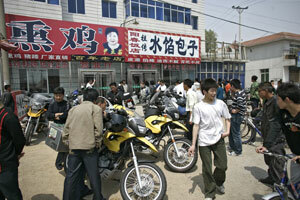 Coming out from lunch, you'll find teams of people taking turns sitting on the bikes. A sea of cell phones have now been deployed, everyone taking pictures and busily sending them off as email attachments to friends and family. 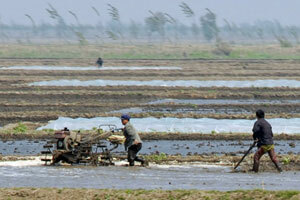 Others are busily text-messaging. Communication between riders and the crowd is done through gestures, show and tell, smiles and mutually incomprehensible chat sessions. It's all in good fun. 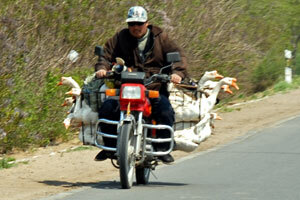 Even off the roads, obstacles abound. 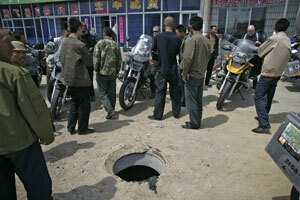 Open sewers, missing manhole covers, broken concrete, and rebar sticking out of dirt, all require a continuous and heightened situational awareness, whether behind the controls, or on foot. 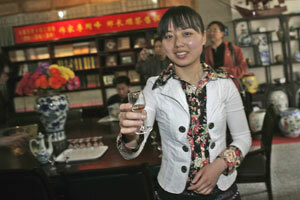 Alcoholic beverages are an integral part of almost every culture. Since our tours are a mix of riding, culture and history, a stop at the local distillery was arranged. Of course, drinking and driving are not to be mixed, so, letting go the throttle, picking up the bottle, we boarded a bus for the Long Dragon Mouth factory in Shenyang. 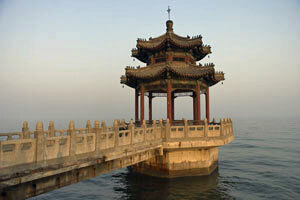 A speciality of the area is the Chinese drink, Bai Chu. 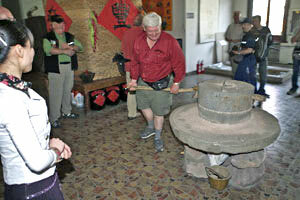 First, sorghum is milled between flat grindstones, as Bard demonstrates by working off the calories to come. Next, the milled sorghum is mixed with rice husks, wheat, and a variety of other grains, wetted down, wrapped in canvas, then allowed to ferment in cement troughs. 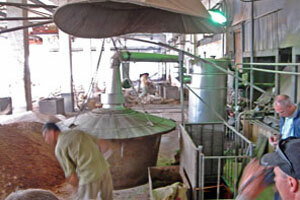 Once the mash has aged, it is loaded into the retort, where it is boiled, and the liquor distilled off. 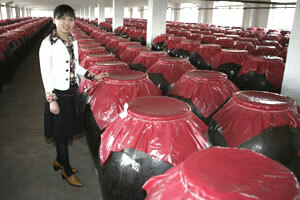 It is then placed in giant clay urns to age, the top floor of the distillery had over a thousand of these. Finally, tasting time. A bit sweet, definitely different, with an alcoholic content of 60% (120 proof), it definitely has a kick and a burn. The name, Bai Chu, is most certainly easy to remember, as it most certainly does "Bite You"! After the distillery tour, some of the group elected to forgo the included (surprise, surprise) Chinese dinner-at-a-round-table, and headed back to the hotel for a Churrasco (pronounced shoo-RAS-koo) BBQ feast, the culinary pride of Brazil. We had no idea how a Brazilian restaurant wound up in a Chinese Hotel beyond the Great Wall, but this was a cultural tour after all, and we felt obligated to do our part. Refusing to partake of bottled beer, we made the universal sign language for large (hands spread apart vertically) mug (hand clenched as if holding a beer mug handle) beer (hand, still clenching imaginary handle raised to mouth with held tilted back). Finally comprehending, the staff brought EIGHT PITCHERS, for the eight of us who ordered beer. As Curtis demonstrates, the live Brazilian band and festooned dancer helped make short work of the "big" beers. 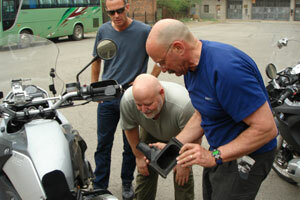 Oh, and the food was pretty good too. . . .
We arrived in Harbin today on our northward trek to the Russian border. 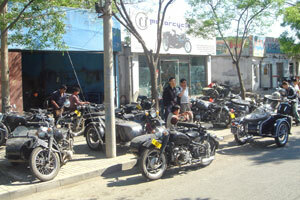 The local motorcycle group met us a few blocks from the hotel and gave us an enthusiastic welcome. The crowd surrounding our bikes reminded us of our first trip, however, the authorities kept the on- lookers away from our bikes so we could check into the hotel before moving the bikes to a more secure area. The quality of the roads has improved since 2000 but the villages seem to have changed very little. One province even allowed the group onto the freeway for a while but at the next province change they were quick to round us up and shoo us onto some pretty awful side roads. This was like sending your guests to the lived in and messy family room instead of to the cleaned up and formal living room. The people do not seem as interested in our passing and we do not draw as large a crowd as we did 6 years ago. The horses, donkeys and cows pulling carts are not as numerous, but the ones we see look better fed and have a more lively step. The food is still better than we remember; however, we do have trouble eating the donkey meat when it shows up on the table. We are all getting kind of used to the Chinese food, but McDonalds and KFC are looking pretty good. Since we arrived in Harbin at lunch time and a KFC was right next to the hotel, you can guess where a lot of the group had lunch. We have noticed that the hotel water is quite potable and bottled water seems to be more for the tourists as we do not see much of it for sale anywhere and when we do it costs 3 to 4 times more than beer. 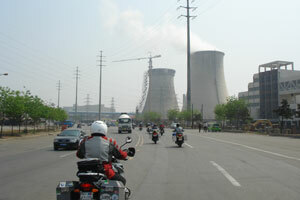 We are seeing a lot of China that is windy, dirty and smoggy. As we begin to experience rougher roads (as when the guide makes a wrong turn, or we get booted off the freeways) the true shake-down is occurring as things are falling off the bikes, parts are breaking and the first flat tire has been tended to. 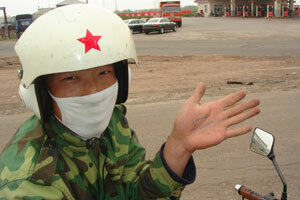 Although there are 750cc motorcycles manufactured in China (for "military, sidecar or racing use only"), motorcycles of over 250cc displacement are generally not allowed. 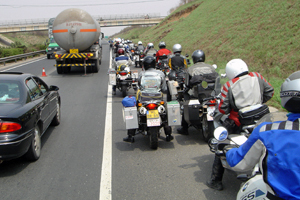 Motorcycles of any size are not allowed on the national toll highways. Non-resident foreigners are generally not issued driving licenses, and foreign-registered vehicles are generally not allowed into the country. Remember, "In China, anything is possible, nothing us easy." Today, our first encounter with the local LEO (Law Enforement Officers). 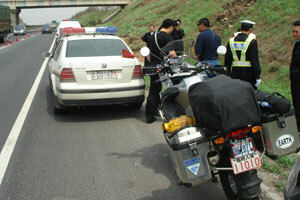 As our 19 non-residents with temporary driving licenses and registrations for their foreign-licensed 650cc to 1200cc bikes motored along the national toll highway out of Shenyang in a well-disciplined 130KPH formation, a squad of police vehicles come roaring onto the highway by going the WRONG WAY on an exit ramp, lights and loudspeakers blaring, and pulled the group over to the side. 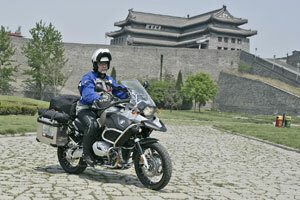 Although our ever-so-capable guide Sim had convinced the toll booth guard at the highway entrance that our group should be allowed, because every previous group had been allowed, the police were there to politely but firmly insure that the letter of the law regarding "no motorcycles on national toll highways" was observed. At this point, I'm sure the increasingly clever Sim was explaining "I have no idea who these guys are, they've been following me all the way from Beijing", or something to that effect. The riders all took it in good stride, and did all the things any group of riders would do during a break. Lots of photos were taken, bladders relieved, water and snacks consumed, and jokes bandied around about the adventure finally beginning. We were directed to make a U-turn, cross through the center divider, and take the nearest exit by going the opposite direction, fortunately, only a few hundred yards away. No citations were issued, and with our compliance thus demonstrated, the police went on their way. 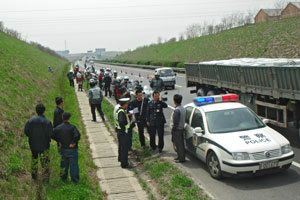 Several times since the tour begin, I often wondered aloud "What would one have to do to actually get a traffic ticket in China.?" The good news, I still haven't found out. . . . I'm hoping that poor toll booth guard isn't pounding rocks somewhere. 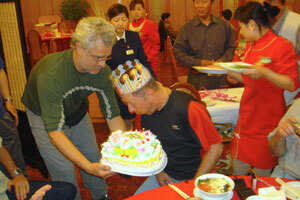 Another first, Eef Peederman celebrated his 41st birthday at a Chinese dinner-at-a-round-table in Changchun, China. In the first picture, adorned in his mandatory birthday crown, Eev performs the time-honored ritual of blowing out the candles as Helge holds the magnificently decorated cake. In the second, he's ready to dive into a (Chinese) traditional bowl of birthday noodles once he sets down his (Western) mandatory birthday beer (this time, served in a properly chilled mug). 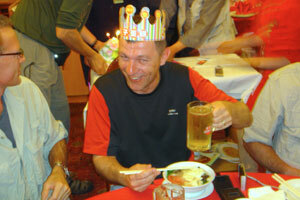 The Chinese believe than long noodles are a symbol of a long life, so a bowl of noodles on your birthday is good luck. 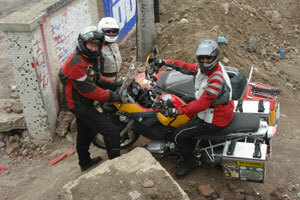 It's true that younger riders may have the time, or the money, for a GlobeRiders Adventure Tour, but few have both. At 41 years of age, Eef is the youngest rider on this year's tour. May he enjoy many more happy rides to come! 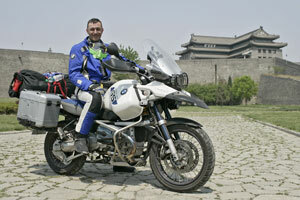 Frank at the Eastern End of the Great Wall of China. 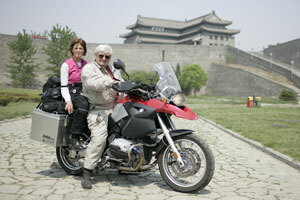 Kathy and Bard Boand at the Eastern End of the Great Wall of China. 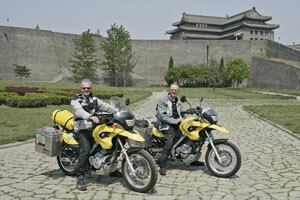 Matthew and Wim Daalderop at the Eastern End of the Great Wall of China. 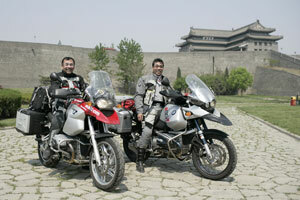 Tamotsu Enoki and Yasuaki Sasamoto at the Eastern End of the Great Wall of China. 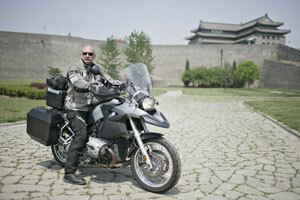 Pierre Michaud at the Eastern End of the Great Wall of China. 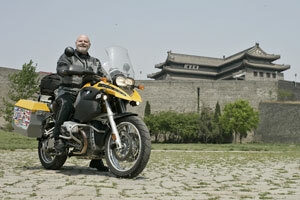 Mike Paull at the Eastern End of the Great Wall of China. 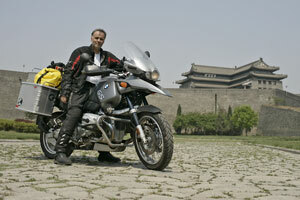 Helge Pedersen at the Eastern End of the Great Wall of China. 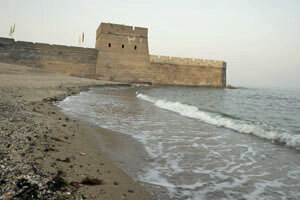 Eef Peerdeman at the Eastern End of the Great Wall of China. 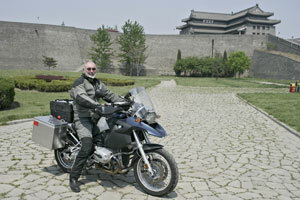 Jim Russell at the Eastern End of the Great Wall of China. 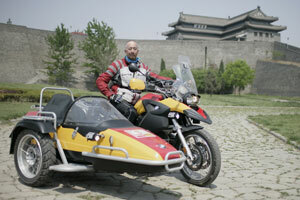 Elliot Schulman at the Eastern End of the Great Wall of China.